Nonprofit Financial Oversight is designed to serve as a resource for nonprofit board members, officers, finance committee members, audit committee members, and anyone else with financial oversight responsibilities in a nonprofit organization. 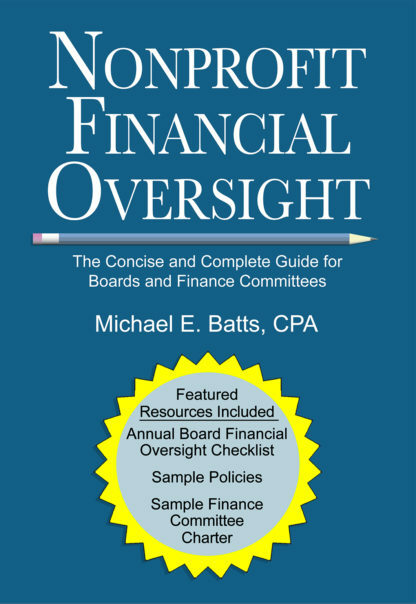 Special features of the book include sample policies, a sample finance committee charter, audit committee guidelines, and an annual board financial oversight checklist. The checklist serves as an annual checkup to help nonprofit boards make sure their financial bases are covered. Your board or finance committee can know the bases are covered by using this helpful plain-language checklist as a reminder of key financial oversight issues that should be addressed annually. Not only does Nonprofit Financial Oversight share in a straightforward manner the key financial policies most nonprofit organizations should have in place, it provides an array of sample policies to greatly simplify the process of adopting them. Nonprofit Financial Oversight will help you determine whether your organization needs a finance committee or an audit committee. And if you do, you will be equipped with a ready-to-go sample finance committee charter and guidelines for an audit committee charter. 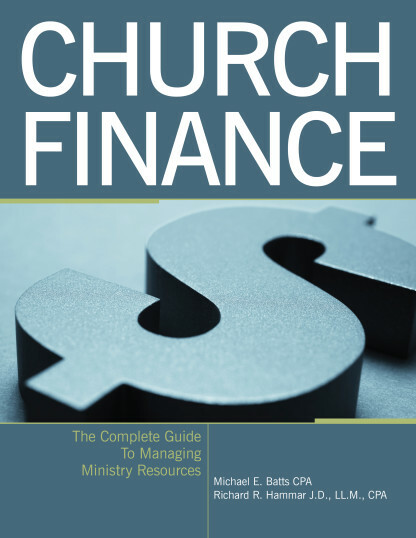 Church Finance, a new, ground-breaking comprehensive guide created by respected experts and CPAs, Richard R. Hammar and Michael E. Batts, gives treasurers, bookkeepers, business administrators, and executive pastors the key information they need to manage every aspect of church finances. From building rock-solid internal controls, to sound budgeting practices, to understanding the intricacies of payroll taxes and housing allowances, Church Finance is the “go-to” reference for church leaders. Using straight-forward language, the authors of Church Finance delve deeply into the critical issues all churches must address — budgeting, financial reporting, tax compliance, insurance coverage, and more. Serving on a nonprofit board can be an incredibly rewarding experience for the properly prepared board member. This book is for the generous and busy people who agree to give of their time and talents by serving on nonprofit boards. Nonprofit boards often fail to do a good job of board member orientation for a variety of reasons. It takes a significant amount of time and effort to plan and conduct quality board member orientation programs, and every time a new board member arrives, it’s time to do it again! Because of the challenges associated with providing quality board member orientation, many nonprofit organizations do not do it at all, leaving their board members to wing it. This book provides help and support to the truly great men and women serving on nonprofit boards whose service makes a positive difference in the lives of countless people every day. This book is a concise and appropriately comprehensive guide to nonprofit board service designed especially for new board members. It is a quick read, (about one hour), yet it addresses with accuracy the most significant elements of board service, such as mission, responsibility, duty, risk, liability, and board meeting dynamics. Your board members read Chapters 1-9 of the book, which will provide them with insights regarding the key elements of nonprofit board service. You provide the board members with copies of the documents described in Chapter 10 related to your organization. You meet with your board members to discuss the unique attributes of your organization following the discussion questions provided in Chapter 10.